When it comes to production of one-off castings, one often needs to prepare special tools to check their quality. 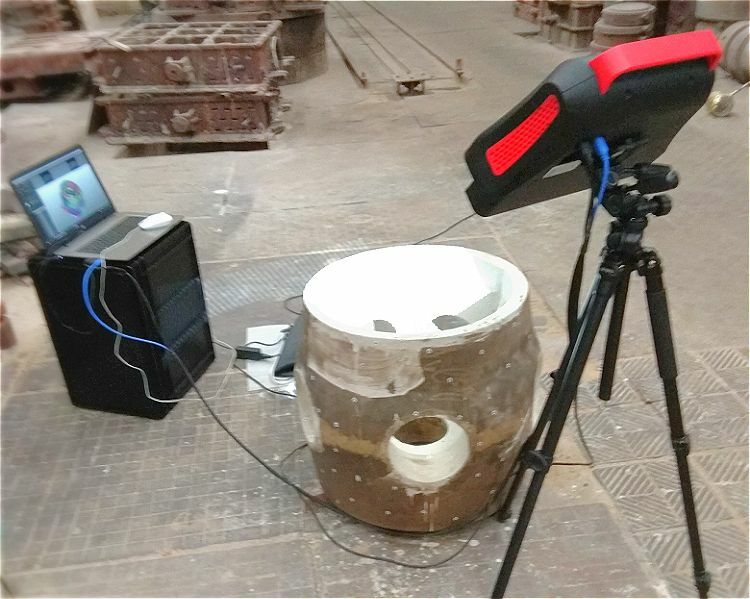 Engineers of Krasnoye Sormovo Shipyard (a member of the United Shipbuilding Corporation) in Nizhny Novgorod decided to improve and speed up the workflow with the help of 3D scanning technology. Tankers, made by "Krasnoye Sormovo", were repeatedly marked by The Royal Institution of Naval Architects (UK) as one of the most innovative and important commercial designs delivered during the year by shipyards worldwide. The production share in the segment of mixed-navigation vessels with deadweight up to 13000t has been about 40% throughout the last three years. The building giant pays due attention to technological effectiveness of its manufacturing processes and as a result has first-hand experience of using 3D scanners for the purpose of quality control. An object being scanned was a controllable-pitch propeller hub with an outside diameter of 800mm and a height of 700mm. Foundry engineers defined minimum allowances on bore diameters in order to decrease a mass of needed metal and cut down machining costs. For the first time in the practice of manufacturing such items, some inside surfaces were cast without allowances, that resulted in an increase of requirements to mold production and pattern equipment quality. 3D scanning seems to be the best way to verify the actual dimensions of a casting. Indeed, it provides the whole picture with full object geometry whereas any other quality control method would enable only some dimensions or sections to be checked. Firstly, RangeVision engineers put markers on the hub’s surface in order to make the 3D scan registration process automatic. After that they collected 3D data from different angles by moving a 3D scanner RangeVision PRO 2М around the object and then created a 3D model on the basis of a hundred obtained 3D scans using the program ScanCenter NG. The next step was to export the model into an STL file so as to compare it with the given mathematical model and generate a report on section dimensions in GOM Inspect. As a result, the client had all the needed information about the correspondence between the actual geometry of the casting and its theoretical model by the end of that day. Many components for shipbuilding are usually produced by casting. Complex shapes of typical parts, such as strut palms, hawses, fairwaters, blades, screws and hull fittings – make it difficult to control their quality by mechanical means. It could be performed only several months later after casting, because it was necessary to turn the part at a machining workshop or even on a building berth. Therefore, 3D scanning is nowadays considered to be the optimal interim method for quality control.